Leica Geosystems offers a "smart" DGPS antenna, which can provide highly accurate position and velocity inputs to a laptop or other system. The apMK31 is a single integrated unit, containing 12-channel GPS receiver and a two- channel beaconed DGPS receiver, all sealed in a low- profile weatherproof fiberglass radome. The antenna unit connects via a standard cable to the COM port in a PC or other device. Mark-3 is a new compact radar designed for small fish- ing boats and pleasure craft. Alarm offers aural and visual alarms when a target enters/exits a user-preset area. Wavetalk is easily installed and comes com- plete with all mounting brackets and marine hard- ware. The antenna can be mounted flush to the deck or on a standard one-in. marine mount. Long safety-rated antenna cables allow aboveboard flexibility in mount- ing the lightweight, satellite tracking antenna. Wavetalk antennas are available in the medium gain model or the high gain model, called Wavetalk Plus. Service features such as call waiting, forwarding and conferencing are also available on Wavetalk through satellite service providers. OmniTRACS is an interactive information manage- ment that includes two way mobile communications, satellite tracking and fleet management software. OmniTRACS real-time mes- saging, perfor- mance monitor- ing and systems integration, other benefits include increased prof-_l — '-..'•.•ulMtKWUtUMii itability, cost reduction and improved asset utilization. OmniTRACS enables fleets to maintain continuous two-way communications with vessels and crew, 24 hours a day, with no gaps in coverage. The Robertson AP11, from Sim- rad, is an all-weather autopilot for boats measuring up to 40 ft. (12.1 m). The product includes features normally seen on more expensive pilots, such as high/low speed response, automatic compass calibra- tion and active integration with Robertson IS 11 instru- ment system and Shipmate GPS navigators and chart- plotters. When you've invested in the boat of your dreams, you need to protect the engine you depend on. 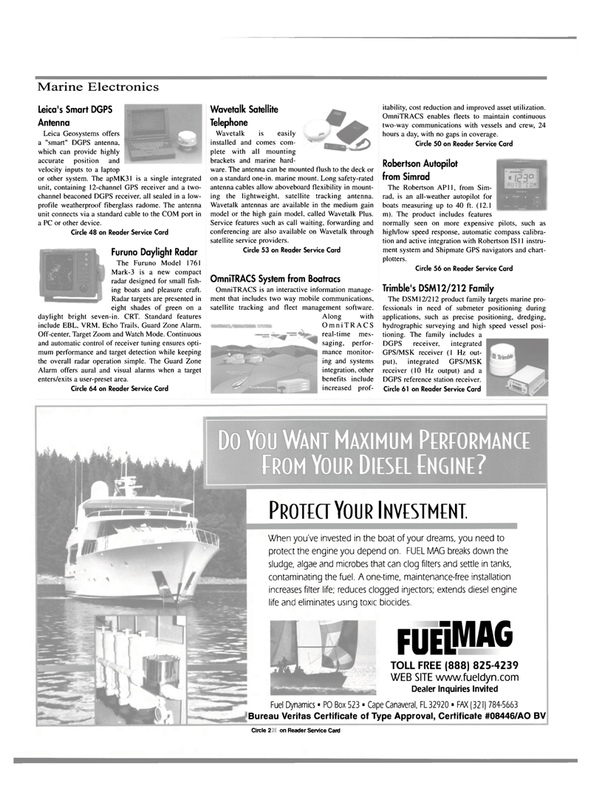 FUEL MAG breaks down the sludge, algae and microbes that can clog filters and settle in tanks, contaminating the fuel. A one-time, maintenance-free installation increases filter life; reduces clogged injectors; extends diesel engine life and eliminates using toxic biocides.